Mini John Cooper Works GP prices | What Car? The Mini John Cooper Works GP is available to order now, at 28,790. 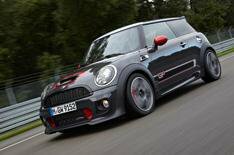 The special-edition model is a heavily modified version of the Mini Cooper John Cooper Works model, with a range of cosmetic and mechanical tweaks. Power comes from a 215bhp version of the John Cooper Works' 1.6-litre turbocharged petrol engine - up from the standard car's 208bhp. Torque rises from 192lbft to 207lb ft and the 0-60mph time is 0.2 seconds quicker, at 6.3 seconds. The GP version has a bespoke suspension set-up, with an adjustable system that allows the ride height to be lowered by up to 2cm. There are also tweaks to improve grip and responsiveness through corners. Lightweight bespoke 17-inch alloy wheels are standard, and there are also upgraded brakes and tyres, and a modified stability control system. The GP's exterior makeover includes large front and rear spoilers and Thunder Grey paintwork, with red edging for the air intakes, door mirrors and tailgate, and GP-badged side stripes. Inside, there are two Recaro sports seats, GP badging and upgraded materials. To reduce weight, there's no rear seat. At 28,790 there's a 6335 premium over the entry-level John Cooper Works model. Production is limited to 2000 cars worldwide: Mini says there's no limit on UK numbers. First deliveries of John Cooper Works GP model will be in November.